This is not just a question for US stocks, given the influence of the US economy and markets over the other leading indexes beyond its borders. In case you haven’t been paying attention, most of Wall Street remains bullish and many have upgraded their forecasts for US stocks. Here we cover the latest balance of bullish and bearish factors and weigh in on the rally’s durability. Raymond James’ strategist Jeff Saut is bullish for the coming weeks, but bearish beyond that. He sees a dip coming this week, followed by another, final rally to new highs in late January. Saut correctly made a prescient call for a pullback last July, so he’s been hot recently. Even with the QE taper, the Fed’s balance sheet should still expand by some $435 billion in the new year from the remaining QE and other programs. He reminds us in a yearend not that…there has been a very tight correlation (R2) between the expansion of the Fed’s balance sheet and stock prices since 2009. If the Fed expands its balance sheet by another 12% over the coming year, it is conceivable the SPX could increase by another 12%. 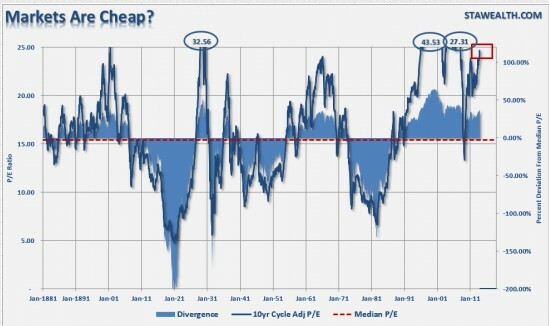 He doesn’t buy the bear’s argument that PE multiples expansion (buyers paying higher prices for stocks despite historically high PE above 16 ratios that historically revert to a lower mean below 16 due to falling stock prices as buyers sell overpriced stocks at the first sign of trouble). Even if stocks plunge, that’s less of a risk because most companies have gone from offering defined benefit pension plans) to offering defined contribution plans (e.g. 401k plans), which puts all of the investment risks squarely on the employee. 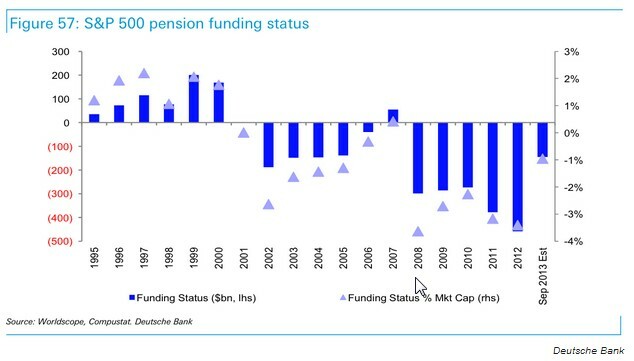 Note in the chart below, how pension liabilities have been cut back. Not great for employees, but a positive for earnings and thus future stock prices. Others see too much conflicting data to be able to give more than a wide range of where the S&P 500 and other stocks could go. For example Wells Fargo’s Gina Martin Adams gives a subdued target of 1850 (where the index is now) but says she could see it ranging from 1500- 2100! The bullish factors that she sees include improving capex spending, exports, and reduced fiscal drag driving stronger revenue growth and thus stronger earnings. She believes rising rates from the taper will exert the most downward pressure on stock prices. See here for full details on her thoughts. 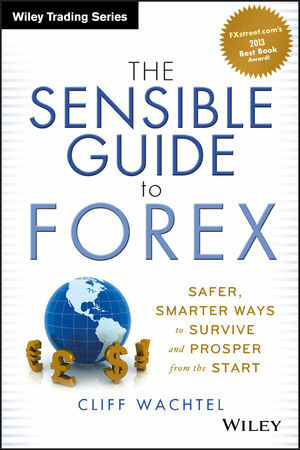 She, like other bulls, recommend investors be overweight cyclical stocks that benefit from growth (tech, health care, financials), and be underweight stocks that are less sensitive to growth and more sensitive to rising rates (consumer staples utilities, telcom, energy, and materials) based on both relative valuations AND the bullish growth assumptions. These fit well for growth investors, but don’t fit well for income investors seeking stable, high income and less downside risk, especially if rates and growth remain muted. The latter sectors tend to offer higher yields and less sensitivity to weak growth. These sectors also suffer less from rate increase as long as these occur gradually, which is what the Fed will try to ensure. Given the endurance of the current rally, the accommodative Fed policy (even with the taper) that keeps liquidity up and rates down, the typical bearish perspective starts with an admission that they too are long but that there are red flags to watch that make them ready to take profits. Granted, all agree that valuation measures are troubling, but that markets can stay overvalued for a long time, so such measures are of little use for timing purposes. The point is, before even considering the risks to the prime supports of this rally (no rate or EU crisis shocks), valuations are big part of the ‘wall of fear that both supports bull markets (otherwise you no one left to fuel future price increases) but can ultimately kill them. 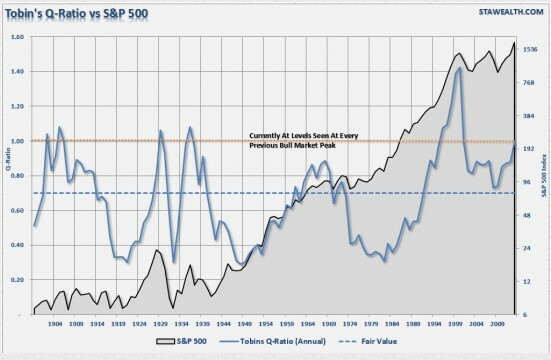 He also sites a chart of Tobin’s Q ratio (aggregate value of S&P 500 firms/replacement cost). If we again exclude the tech bubble of 2000, the current market is near the peak of every other bull market in history. 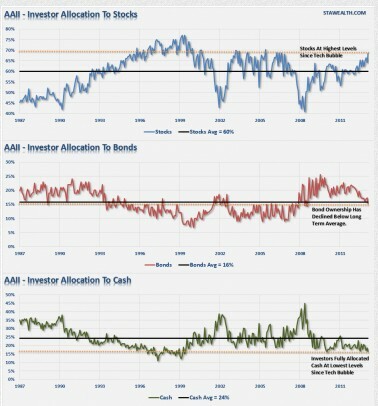 The chart below shows the percentage of stocks, bonds and cash owned by individual investors per the American Association of Individual Investor’s survey. Stock ownership and near record low levels of cash suggest that the individual investor is already fully invested. How this lack of excess retain investor cash is confirmed by peaks in margin debt not seen since….you guessed it, the prior pre-crash peaks of 2000 and 2007. How both retail (per AAII survey) and institutional (per IN VI Survey) investor sentiment are at levels suggesting a sharp drop in the S&P 500 in the coming months. The historically accommodative policies of the Fed, ECB, BoJ, etc. have been a prime cause in the global rally of the past years, but they are historical aberrations that for a variety of reasons can’t last. True, but that doesn’t mean they’re going away in the coming year, or that they will stop working. In sum, the rally’s drivers remain in effect until proven otherwise. 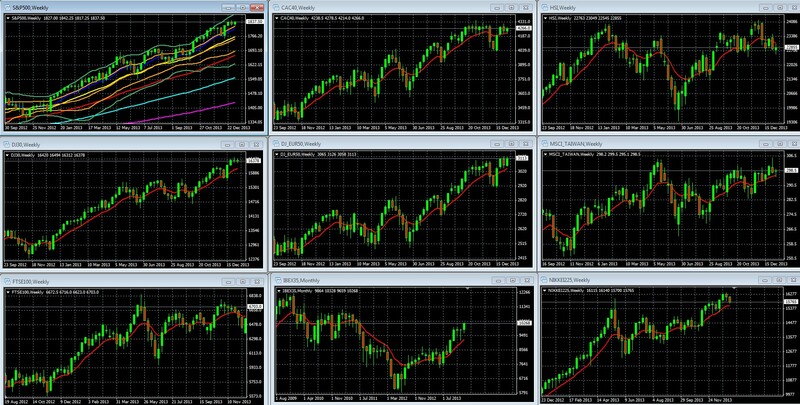 Per their weekly charts, momentum for the US rally remains fully entrenched, both in for US and for leading international markets.